Update: The last A-stock train in regular service is reported to be leaving central London on 26 September at 1808, bound for Watford. It will then leave Watford at 1917, terminating at Harrow-on-the-Hill. The Metropolitan Line's A-stock trains, which have plied the rails between Aldgate and all points north-west London since 1960, are coming to the end of the line. Only four remain in service, and all will be withdrawn in the next couple of weeks. As is customary, there will be a final, farewell ride on one of the last trains. London Reconnections reports that it will begin at 9.40am on 29 September, and take in all Metropolitan line stations during its day-long meander. Tickets cost £40, and only a few are left. If you miss out, or don't fancy paying a princely sum for the outing, your best bet is to loiter around Baker Street in the hope of seeing one. According to LR, the last passenger service is likely to run in the week leading up to the 29th, while London Underground will maintain one working unit for engineering purposes (and perhaps the occasional heritage run in the future). 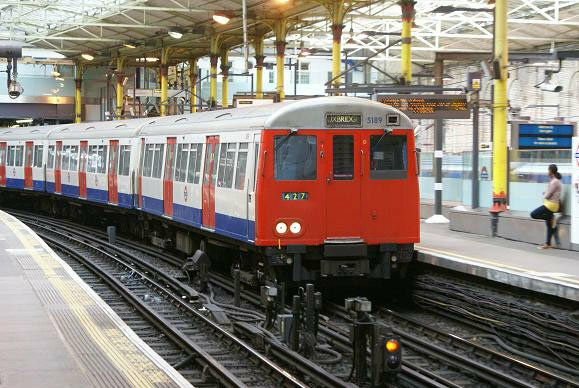 The long farewell to London Underground's longest-serving rolling stock began over two years ago, when the sleek new air-conditioned S-stock trains first entered service. Since then, the older trains have been gradually replaced and taken away for scrapping, though some of the more iconoclastic bits are surviving: the luggage racks, upon which Mr. Pinstriped of Pinner would store his briefcase as he commuted to and from Metroland, can be bought from the London Transport Museum.